I was looking for a different vegetable to throw on the grill the other day, and since I had a few sweet potatoes I decided to use those up. I love sweet potatoes, but unfortunately my son hates them. Isn't that weird? You would think kids would like them...I mean they're sweet, so what's not to like??? Anyway, I also had fresh garlic, thyme and scallions needing to be used up so I decided to throw it all in there with some olive oil. Never used those ingredients all together with sweet potatoes before, so I wasn't sure what it would taste like. Thankfully, I loved the end result. I couldn't stop eating/picking at it, even long after dinner was over. Just so good! Preheat the grill on medium-low heat. 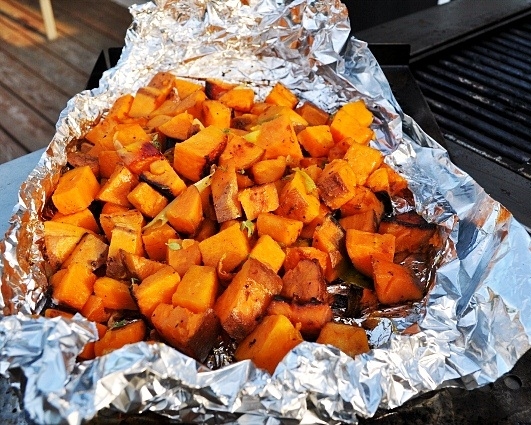 Line a flat grill pan, or cookie sheet, with aluminum foil. Place the sweet potatoes, scallions, thyme & garlic into a large bowl. Drizzle with olive oil, and season generously with salt and pepper. 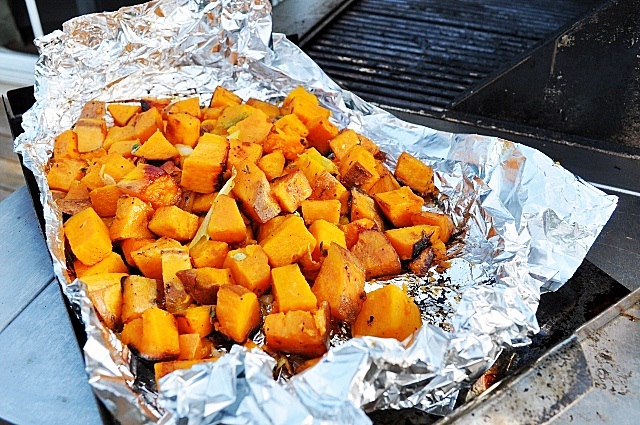 Toss until well combined, then place on your grill pan. Cover with aluminum foil and seal around the edges. Cook until potatoes are tender (about 20-30 minutes), stirring every so often to make sure it's not burning. Ok. I was really skeptical about these potatoes be cause I've never had sweet potatoes with salt and pepper but they were incredible!! Will definitely make again!